Image shows a composite where blue represents the MagAO data taken at H-alpha, and green and red show the LBT data taken at Ks and L' bands. The greyscale is a previously published millimeter image of the disk. Image courtesy Stephanie Sallum. There are 450 light-years between Earth and LkCa15, a young star with a transition disk around it, a cosmic whirling dervish, a birthplace for planets. Despite the disk's considerable distance from Earth and its gaseous, dusty atmosphere, University of Arizona researchers captured the first photo of a planet in the making, a planet residing in a gap in LkCa15's disk. Of the roughly 2,000 known exoplanets - planets that orbit a star other than our sun - only about 10 have been imaged, and that was long after they had formed, not when they were in the making. "This is the first time that we've imaged a planet that we can say is still forming," says Steph Sallum, a UA graduate student, who with Kate Follette, a former UA graduate student now doing postdoctoral work at Stanford University, led the research. The researchers' results were published in Nature. Only months ago, Sallum and Follette were working independently, each on her own Ph.D. project. But serendipitously they had set their sights on the same star. Both were observing LkCa15, which is surrounded by a special kind of protoplanetary disk that contains an inner clearing, or gap. 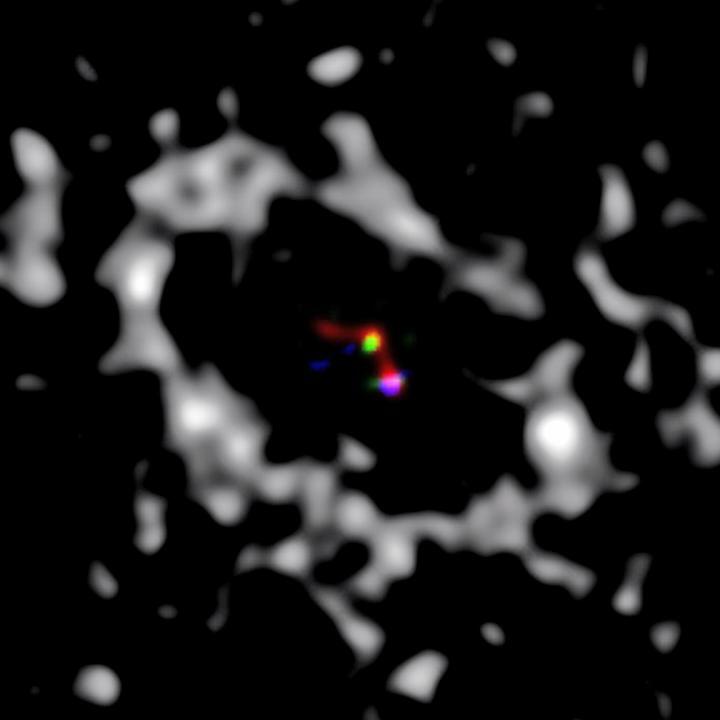 Protoplanetary disks form around young stars using the debris left over from the star's formation. It is suspected that planets then form inside the disk, sweeping up dust and debris as the material falls onto the planets instead of staying in the disk or falling onto the star. A gap is then cleared in which planets can reside. The researchers' new observations support that view. Sallum says researchers are just now being able to image objects that are close to and much fainter than a nearby star. "That's because of researchers at the University of Arizona who have developed the instruments and techniques that make that difficult observation possible," she says. Those instruments include the Large Binocular Telescope, or LBT, the world's largest telescope, located on Arizona's Mount Graham, and the UA's Magellan Telescope and its Adaptive Optics System, MagAO, located in Chile. Capturing sharp images of distant objects is difficult thanks in large part to atmospheric turbulence, the mixing of hot and cold air. "When you look through the Earth's atmosphere, what you're seeing is cold and hot air mixing in a turbulent way that makes stars shimmer," says Laird Close, UA astronomy professor and Follette's graduate adviser. "To a big telescope, it's a fairly dramatic thing. You see a horrible-looking image, but it's the same phenomenon that makes city lights and stars twinkle." Josh Eisner, UA astronomy professor and Sallum's graduate adviser, says big telescopes "always suffer from this type of thing." But by using the LBT adaptive optics system and a novel imaging technique, he and Sallum succeeded in getting the crispest infrared images yet of LkCa15. Meanwhile, Close and Follette used Magellan's adaptive optics system MagAO to independently corroborate Eisner and Sallum's planetary findings. "Results like this have only been made possible with the application of a lot of very advanced new technology to the business of imaging the stars," says professor Peter Tuthill of the University of Sydney and one of the study's co-authors, "and it's really great to see them yielding such impressive results." Our Sun is a relatively quiet star that only occasionally releases solar flares or blasts of energetic particles that threaten satellites and power grids. You might think that smaller, cooler stars would be even more sedate. However, astronomers have now identified a tiny star with a monstrous temper. It shows evidence of much stronger flares than anything our Sun produces. If similar stars prove to be just as stormy, then potentially habitable planets orbiting them are likely to be much less hospitable than previously thought. "If we lived around a star like this one, we wouldn't have any satellite communications. In fact, it might be extremely difficult for life to evolve at all in such a stormy environment," says lead author Peter Williams of the Harvard-Smithsonian Center for Astrophysics (CfA). The research team targeted a well-known red dwarf star located about 35 light-years from Earth in the constellation Boîtes. The object is so small and cool that it's right on the dividing line between stars (which fuse hydrogen) and brown dwarfs (which don't). One of the things that makes this small star remarkable is that it spins rapidly, completing a full rotation about every 2 hours. Compare that with our Sun, which takes nearly a month to spin once on its axis. Previous data from the Karl G. Jansky Very Large Array in Socorro, NM showed that this star has a magnetic field several hundred times stronger than our Sun. This puzzled astronomers because the physical processes that generate the Sun's magnetic field shouldn't operate in such a small star. "This star is a very different beast from our Sun, magnetically speaking," states CfA astronomer and co-author Edo Berger. The researchers examined the star with the new Atacama Large Millimeter/submillimeter Array (ALMA) and detected emission at a frequency of 95 GHz. This is the first time that flare-like emission at such high frequencies has been detected from a red dwarf star. Our Sun generates similar emission from solar flares but only intermittently. What's more, the emission from this star is 10,000 times brighter than what our own Sun produces, even though it has less than one-tenth of the Sun's mass. The fact that ALMA detected this emission in a brief 4-hour observation suggests that the red dwarf is continuously active. This has important implications for the search for habitable planets outside the Solar system. Red dwarfs are the most common type of star in our galaxy, which makes them promising targets for planet searches. But because a red dwarf is so cool, a planet would have to orbit very close to the star to be warm enough for liquid water to exist. That proximity would put the planet right in the bull's-eye for radiation that could strip its atmosphere or destroy any complex molecules on its surface. "It's like living in Tornado Alley in the U.S. Your location puts you at greater risk of severe storms," explains Williams. "A planet in the habitable zone of a star like this would be buffeted by storms much stronger than those generated by the Sun." New telescope data pinpoints 574 massive galaxies that formed early on in the universe's life, and researchers can't yet explain how they formed so quickly. New research has revealed 574 massive, ancient galaxies lurking in the night sky, and their existence so close to the time of the Big Bang calls into question scientists' best understanding of how large galaxies form. The objects are so old that they lack a defined shape; the regular ellipses and spiral galaxies solidified later on in the universe's lifetime. A new video released Wednesday (Nov. 18) from the European Southern Observatory (ESO) reveals the ancient galaxies' locations. When they peer at distant galaxies, researchers are looking back in time. So to learn about the earliest years of the universe, scientists need to measure extremely faint and faraway star systems, whose light is often found in the infrared. To focus in on the earliest massive galaxies and determine their age, the researchers combined data from the Spitzer Space Telescope, an orbiting infrared telescope, and the European Southern Observatory'sVisible and Infrared Survey Telescope for Astronomy (VISTA) in Chile. Spitzer's data pointed the way to fainter galaxies that were easy to overlook in VISTA's near-infrared measurements. Then, data from the UltraVISTA survey, which has been scrutinizing one patch of sky since December 2009, gave greater definition and helped the researchers identify how old those fainter galaxies were. With UltraVISTA, "we're just observing the same part of the sky over and over again," Henry McCracken, a researcher at Institut d'Astrophysique de Paris in France and co-author on the paper, told Space.com. "It's like the world's most boring observing program," he joked. But the results are far from boring: Because of the deep scrutiny (and the world's most efficient infrared camera, McCracken added), UltraVISTA can pick up extremely hard-to-see features and distant galaxies, which it releases for free so astronomers can analyze and make use of the data. "The obvious question, then, was to say: When was the first time in which these very massive galaxies appeared?" Caputi said. The team of researchers found that the most massive galaxies were not found until around 1 billion years after the Big Bang, ESO officials said in a Nov. 18 statement — but many more than expected formed between 1.1 billion and 1.5 billion years after the Big Bang, much sooner than many models can account for. The researchers reported their work in The Astrophysical Journal in September. "The predominant theory for galaxy formation is a hierarchical model. You basically assemble galaxies by merging lots of small, little bits," McCracken said. This slow growth of galaxies can explain Earth's local universe well — what the universe looks like at this age — but is simply not fast enough to account for so many massive galaxies so soon after the Big Bang. "There's basically not enough time for these kinds of objects to form," McCracken said. The researchers said that the faintness of galaxies from the early universe, even massive ones, means that it's possible the survey missed more galaxies even closer to the Big Bang that were obscured by dust. The results might be skewed by dust in another way, as well: Garth Illingworth, an astronomer at University of California, Santa Cruz and the Lick Observatory, told Space.com that the heavy dust could make it more difficult to judge the galaxies' age — there are many more evolved galaxies from later after the Big Bang, and even a few newer galaxies that appeared older could be misleading. This series of images from the VISTA survey telescope shows a collection of previously hidden monster galaxies born when the universe was in its infancy, scientists say. The researchers released their data publicly so others can follow up with their own work. That could include further investigation of measurements from VISTA and Spitzer, as well as views from other telescopes, if possible, like the Atacama Large Millimeter/submillimeter Array, which could image the gas clouds around the early galaxies, and Hubble's successor, the under-construction James Webb Space Telescope. All could help shed light on the earliest conditions of the universe and help reveal the monster galaxies lurking there. "The data's there," McCracken said. "Other people can see if they agree with us or not." Artist’s conception of a star being drawn toward a black hole and destroyed (left), and the black hole later emitting a “jet” of plasma composed of the debris left from the star’s destruction. Modified from an original image by Amadeo Bachar. An international team of astrophysicists led by a Johns Hopkins University scientist has for the first time witnessed a black hole swallowing a star and ejecting a flare of matter moving at nearly the speed of light. The finding reported Thursday in the journal Sciencetracks the star—about the size of our sun—as it shifts from its customary path, slips into the gravitational pull of a supermassive black hole and is sucked in, saidSjoert van Velzen, a Hubble fellow at Johns Hopkins. "These events are extremely rare," van Velzen said. "It's the first time we see everything from the stellar destruction followed by the launch of a conical outflow, also called a jet, and we watched it unfold over several months." Black holes are areas of space so dense that irresistible gravitational force stops the escape of matter, gas and even light, rendering them invisible and creating the effect of a void in the fabric of space. Astrophysicists had predicted that when a black hole is force-fed a large amount of gas, in this case a whole star, then a fast-moving jet of plasma—elementary particles in a magnetic field—can escape from near the black hole rim, or "event horizon." This study suggests this prediction was correct, the scientists said. "Previous efforts to find evidence for these jets, including my own, were late to the game," said van Velzen, who led the analysis and coordinated the efforts of 13 other scientists in the United States, the Netherlands, Great Britain and Australia. Supermassive black holes, the largest of black holes, are believed to exist at the center of most massive galaxies. This particular one lies at the lighter end of the supermassive black hole spectrum, at only about a million times the mass of our sun, but still packing the force to gobble a star. The first observation of the star being destroyed was made by a team at the Ohio State University, using an optical telescope in Hawaii. That team announced its discovery on Twitter in early December 2014. After reading about the event, van Velzen contacted an astrophysics team led by Rob Fender at the University of Oxford in Great Britain. That group used radio telescopes to follow up as fast as possible. They were just in time to catch the action. By the time it was done, the international team had data from satellites and ground-based telescopes that gathered X-ray, radio and optical signals, providing a stunning "multi-wavelength" portrait of this event. It helped that the galaxy in question is closer to Earth than those studied previously in hopes of tracking a jet emerging after the destruction of a star. This galaxy is about 300 million light years away, while the others were at least three times farther away. One light year is 5.88 trillion miles. The first step for the international team was to rule out the possibility that the light was from a pre-existing expansive swirling mass called an "accretion disk" that forms when a black hole is sucking in matter from space. That helped to confirm that the sudden increase of light from the galaxy was due to a newly trapped star. Van Velzen last year completed his doctoral dissertation at Radboud University in the Netherlands, where he studied jets from supermassive black holes. In the last line of the dissertation, he expressed his hope to discover these events within four years. It turned out to take only a few months after the ceremony for his dissertation defense. Van Velzen and his team were not the only ones to hunt for radio signals from this particular unlucky star. A group at Harvard observed the same source with radio telescopes in New Mexico and announced its results online. Both teams presented results at a workshop in Jerusalem in early November. It was the first time the two competing teams had met face to face. "The meeting was an intense, yet very productive exchange of ideas about this source," van Velzen said. "We still get along very well; I actually went for a long hike near the Dead Sea with the leader of the competing group." Support for this study came from sources including NASA, the Netherlands Foundation for Scientific Research (NOW), the European Research Council, the International Centre for Radio Astronomy Research, the Alfred P. Sloan Foundation and the Australian Research Council. 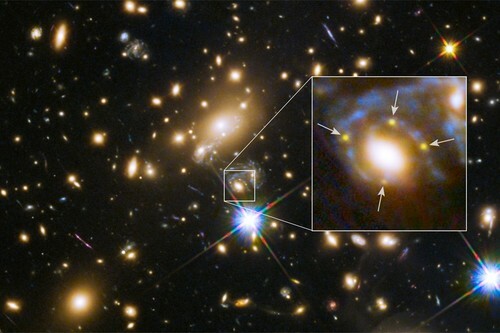 The four time-delayed images of this supernova would have already made Supernova Refsdal an unprecedented discovery. But in this case the universe has more in store because the supernova is expected to make a return appearance within the next five years. "My team," Rodney said, "will continue to monitor this galaxy cluster with Hubble, watching for the appearance of that fifth and final image. We're hoping this time we can catch it early, as it first arrives, to get an even better measurement of this unique explosion." 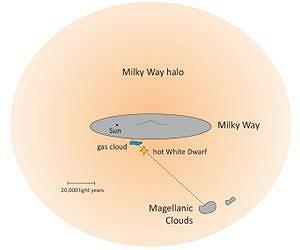 Diagram of the Milky Way showing our Sun, the white dwarf, and the gas cloud relative to our neighbor galaxy, the Large Magellanic Cloud (adajcent to it the Small Magellanic Cloud). The white dwarf RX J0439.8-6809 and the gas cloud are between us and the Large Magellanic Cloud. Image courtesy Philipp Richter/University of Potsdam. Astronomers at the Universities of Tubingen and Potsdam have identified the hottest white dwarf ever discovered in our Galaxy. With a temperature of 250,000 degrees Celsius, this dying star at the outskirts of the Milky Way has already even entered its cooling phase. The researchers also were the first to observe an intergalactic gas cloud moving towards the Milky Way - indicating that galaxies collect fresh material from deep space, which they can use to make new stars. These findings are published in the latest Astronomy and Astrophysics. 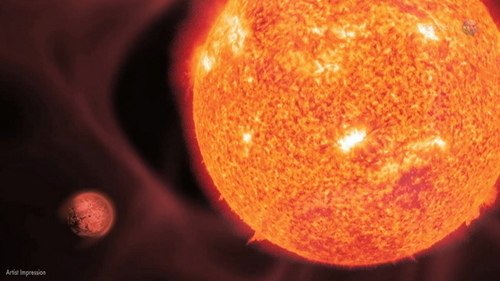 Relatively low-mass stars - like our Sun - get extremely hot towards the end of their lives. The Sun's surface temperature has been fairly constant at around 6000 degrees Celsius since its birth 4.6 million years ago. Immediately before its source of nuclear energy is exhausted in about five billion years, the Sun will reach thirty times that temperature, going to 180,000 degrees before cooling down as a white dwarf. Computer simulations suggest that stars can become even hotter than that. The highest temperature of an observed dying star was measured to be 200,000 degrees. The researchers' evaluation of ultraviolet spectra taken by the Hubble Space Telescope points to a new record of 250,000 degrees - a temperature which can only be reached by a star some five times more massive than our Sun. The white dwarf, RX J0439.8-6809, has already entered the cooling phase. It appears to have reached its maximum temperature of 400,000 degrees about a thousand years ago. Its chemical composition is not yet understood. Analyses show that carbon and oxygen are present on its surface - the products of the nuclear fusion of helium, a process which normally takes place deep in the core of a star. RX J0439.8-6809 was first noticed more than 20 years ago as a very bright spot on X-ray images, indicating a source of tremendous heat. Originally it was thought to be a white dwarf carrying out nuclear fusion on its surface using hydrogen drawn from a companion star. 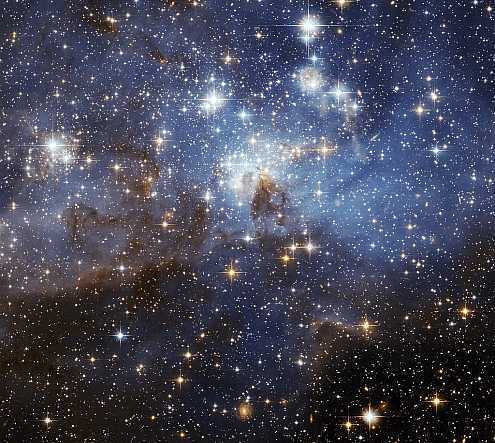 Astronomers also assumed it was located in our neighboring galaxy, the Large Magellanic Cloud. But the new Hubble data show that the star is on the outskirts of the Milky Way, and is moving away from us at a speed of 220 kilometers per second. The star's ultraviolet spectrum held another surprise. It indicates the presence of gas which does not belong to the star; it is part of a cloud between the Milky Way and RX J0439.8-6809. The Doppler effect enables the researchers to determine that this gas cloud is moving away from us at 150 kilometers per second and moves toward the Milky Way. Astronomers knew of the existence of gases traveling at high speed in the direction of the Large Magellanic Cloud, but were unable to tell for sure if they were in the Milky Way or in the LMC. Finding such gas in the spectrum of RX J0439.8-6809 now offers proof that the gas cloud belongs to the Milky Way. But its chemical composition indicates that it originated from intergalactic space - evidence that galaxies collect fresh material from deep space, which they can use to make new stars. Image courtesy ESA/Hubble and NASA, Acknowledgement: Judy Schmidt. This curious galaxy - only known by the seemingly random jumble of letters and numbers 2MASX J16270254+4328340 - has been captured by the NASA/ESA Hubble Space Telescope dancing the crazed dance of a galactic merger. The galaxy has merged with another galaxy leaving a fine mist, made of millions of stars, spewing from it in long trails. Despite the apparent chaos, this snapshot of the gravitational tango was captured towards the event's conclusion. 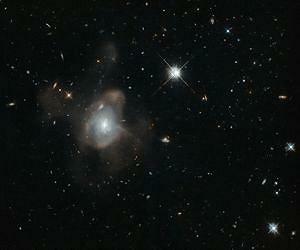 This transforming galaxy is heading into old age with its star-forming days coming to an end. The true drama occurred earlier in the process, when the various clouds of gas within the two galaxies were so disturbed by the event that they collapsed, triggering an eruption of star formation. This flurry of activity exhausted the vast majority of the galactic gas, leaving the galaxy sterile and unable to produce new stars. As the violence continues to subside, the newly formed galaxy's population of stars will redden with age and eventually begin to cool and dim one by one. With no future generations of stars to take their place, the galaxy thus begins a steady path of fading and quieting. A supercomputer simulation of a mere 10 milliseconds in the collapse of a massive star into a neutron star proves that these catastrophic events, often called hypernovae, can generate the enormous magnetic fields needed to explode the star and fire off bursts of gamma rays visible halfway across the universe. The results of the simulation, published online Nov. 30 in advance of publication in the journal Nature, demonstrate that as a rotating star collapses, the star and its attached magnetic field spin faster and faster, forming a dynamo that revs the magnetic field to a million billion times the magnetic field of Earth. A field this strong is sufficient to focus and accelerate gas along the rotation axis of the star, creating two jets that ultimately can produce oppositely directed blasts of highly energetic gamma rays. The first electrical generators were dynamos, generating current as wires rotated through a magnetic field. Stellar dynamos generate electrical currents as magnetic fields move through space, while the currents in turn boost the magnetic field, resulting in a feedback loop that produces monster magnetic fields. "A dynamo is a way of taking the small-scale magnetic structures inside a massive star and converting them into larger and larger magnetic structures needed to produce hypernovae and long gamma-ray bursts," said Philipp Msta, a UC Berkeley postdoctoral fellow and first author of the paper. "That kicks off the process." "People had believed this process could work out," he said. "Now we actually show it." Key to this success was a computer simulation at finer detail than ever before, though one that required 130,000 computer cores operating in parallel over a span of two weeks on Blue Waters, one of the most powerful supercomputers in the world. It is located at the National Center for Supercomputing Applications at the University of Illinois at Urbana-Champaign. Astrophysicists like Msta are trying to improve their models of what stars do when they reach the ends of their lives, hoping to explain strange cosmic phenomena - like gamma-ray bursts and hypernovae that flash 10 times brighter than the average supernova - and understand how some of the very heavy elements found in nature are made. "Now we have the first prototype model that allows us to ask the question, How are heavy elements made in these powerful supernova explosions?" said Eliot Quataert, a UC Berkeley professor of astronomy who was not involved with the study. "The breakthrough here is that Philipp's team starts from a relatively weak magnetic field and shows it building up to be a very strong and large-scale coherent magnetic field of the kind that is usually assumed to be there when people make models of gamma-ray bursts," Quataert said. Gamma-ray bursts are so brief and energetic - long bursts last about 100 seconds, with wavelengths far outside the visible or ultraviolet bands - that they were not observed until 1967 by satellites looking for evidence of nuclear bomb tests. Most are billions of light years away in distant galaxies, so the fact we can see them at all means they are among the brightest events in the universe. Observations over the last 50 years have led astronomers to propose that the bursts are produced during the extremely rare explosions of massive stars - stars 25 times the mass of the sun or larger - but the details of how such a hypernova generates focused beams of gamma rays are still being worked out. These stellar explosions are typically classified as Type Ic broadline supernovae. It is thought that jets held together by ultra-strong magnetic fields are required to power these explosions, Msta said, but one of the missing links was how a star with a normal magnetic field, like that of the sun, could amplify it a quadrillion (1015) times. One possibility is that energy stored in the rotation of the collapsed star could be transformed into magnetic energy. These strong magnetic fields may also be critical to help accelerate charged particles to a speed and energy able to generate a gamma ray. "We expect only a small fraction of stars to be spinning rapidly enough before collapse to explain pulsar spin periods of milliseconds," said co-author Christian Ott, a professor of theoretical astrophysics at the California Institute of Technology. "But if a star is spinning this fast, then there is a lot of energy in the rotation. The problem has been how to extract that and dump it into the explosion." A core-collapse supernova occurs when hydrogen fusion in the core - which powers stars during most of their lifetime - stops after all the hydrogen is used up and the star begins to fuse helium and then carbon and oxygen. When the star finally fuses all these elements into iron, fusion stops entirely and the pressure at the core of the star can no longer support the gravitational weight of the surrounding material. Within one second, the inner star out to a radius of about 1,500 kilometers collapses to a neutron star about 10 to 15 kilometers across, containing the mass of about 1.4 suns. This creates an outward-moving shock wave that plows into the outer layers of the star. As the inner star collapses to a neutron star, it increases its spin just as pirouetting ice skaters spin faster as they draw in their arms. Theorists have attempted to explain how massive, rotating stars generate strong magnetic fields after they have collapsed by a process called magnetorotational instability: Layers of the star rotate at different speeds, creating turbulence that molds the embedded magnetic fields into kilometer-wide magnetic flux tubes much like magnetic flares on the sun. But can this process generate the much larger-scale magnetic fields needed to drive an explosion? 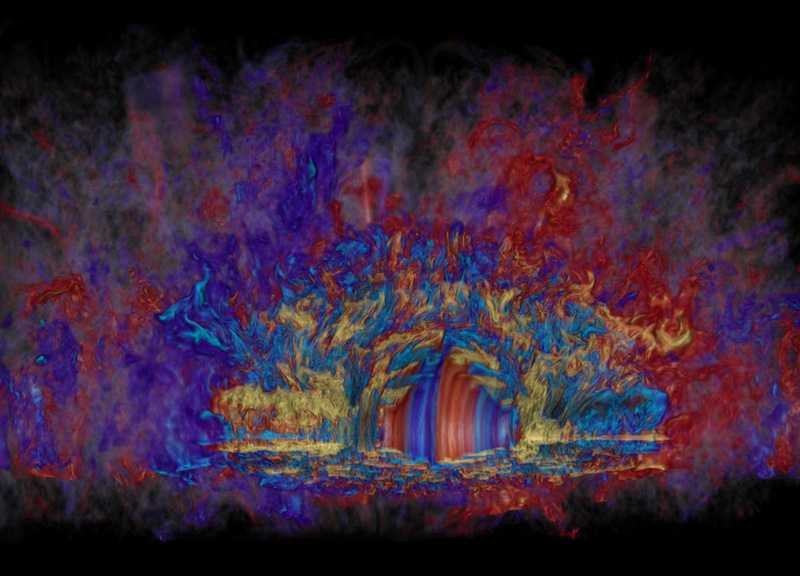 "What we have done are the first global extremely high-resolution simulations of this that actually show that you create this large global field from a purely turbulent one," Msta said. "The simulations also demonstrate a mechanism to form magnetars, neutron stars with an extremely strong magnetic field, which may be driving a particular class of very bright supernovae." Quataert compares the process to how small-scale turbulence in Earth's atmosphere coalesces into large-scale hurricanes. Msta and his colleagues found that the key to this process in a rapidly rotating neutron star is a shear zone about 15 to 35 kilometers from the star where the different layers are rotating at very different speeds, causing turbulence large enough to create a dynamo. Msta is working on simulations that encompass more than 10 milliseconds of the star's evolution after collapse, or "post-bounce," to better understand how the collapsing matter and outflowing material interact with the swirling magnetic fields. Other co-authors with Msta and Ott are David Radice and Luke Roberts of Caltech in Pasadena, Erik Schnetter of the Perimeter Institute and the University of Guelph in Ontario, Canada, and Roland Haas of the Max Planck Institute for Gravitational Physics in Potsdam-Golm, Germany. This research was supported by the National Science Foundation (AST-1212170, PHY-1151197, OCI-0905046), the National Aeronautics and Space Administration's Einstein Fellowship Program and the Sherman Fairchild Foundation. This image shows the results of a digital simulation showing the large-scale distribution of matter, with filaments and knots. Image courtesy V.Springel, Max-Planck Institut fur Astrophysik, Garching bei Munchen. Matter known as ordinary, which makes up everything we know, corresponds to only 5% of the Universe. Approximately half of this percentage still eluded detection. 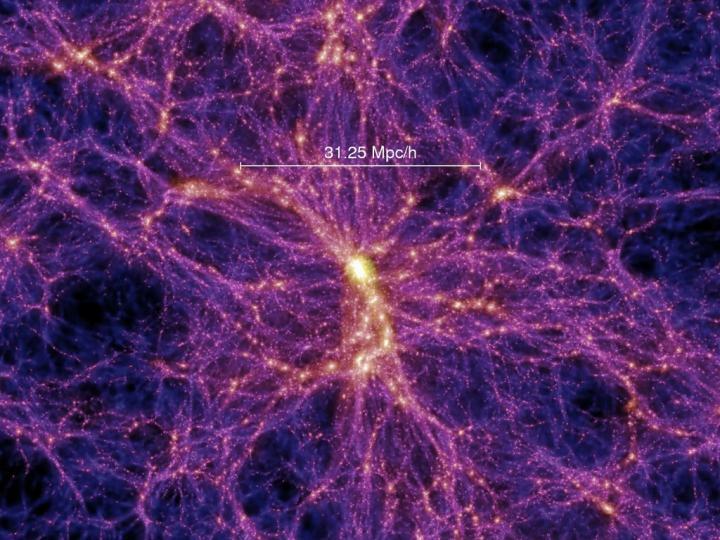 Numerical simulations made it possible to predict that the rest of this ordinary matter should be located in the large-scale structures that form the 'cosmic web' at temperatures between 100,000 and 10 million degrees. A team led by a researcher from the University of Geneva (UNIGE), Switzerland, observed this phenomenon directly. The research shows that the majority of the missing ordinary matter is found in the form of a very hot gas associated with intergalactic filaments. The article reporting this discovery is published in the journal Nature. Galaxies are formed when ordinary matter collapses then cools down. In order to understand the origin of this formation, it was vital to discover in what form and where the ordinary matter that we do not perceive - known as the 'missing baryons' - is found. 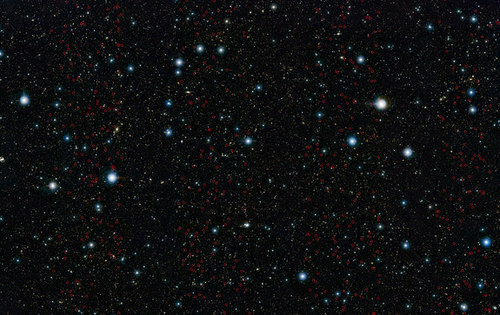 To do this, the astrophysicists from UNIGE and the Ecole polytechnique federale de Lausanne (EPFL) took an interest in Abell 2744, a massive cluster of galaxies with a complex distribution of dark and luminous matter at its center. 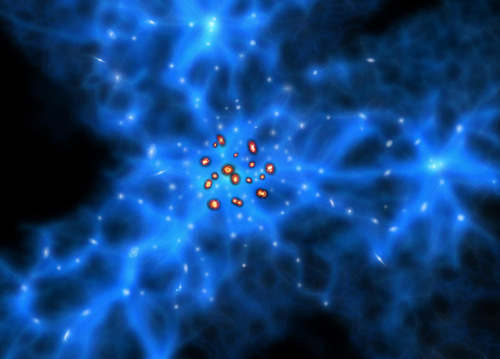 They observed this cluster with the XMM space telescope, which is capable of detecting the signature of very hot gas due to its sensitivity to X-rays. Large-scale galaxy surveys have shown that the distribution of ordinary matter in the Universe is not homogeneous. Instead, under the action of gravity, matter is concentrated into filamentary structures, forming a network of knots and links called the 'cosmic web'. The regions experiencing the highest gravitational force collapse and form the knots of the network, such as Abell 2744. Comparable to neural networks, these knots then connect to one another through filaments, wherein the researchers identified the presence of gas, and consequently, the missing baryons. The astrophysicists pointed XMM in the direction of the areas where they suspected to find the presence of filaments, and therefore, the presence of 10-million degree hot gas structures. For the first time, they were able to measure the temperature and density of these objects, and found that they corresponded to the predictions of the numerical models. For this reason, we now have a grasp of the form taken by the missing ordinary matter. Will the amount of ordinary matter in the universe soon be known? This research is a very significant validation of the models of galaxy formation in the Universe. "Now we must verify that the discovery of Abell 2744's missing baryons is applicable to the entire universe. This will consist in studying these filamentary regions in detail, and measuring their temperature distribution and the various atoms that compose them, in order to understand how many heavy elements there are in the universe," says Dominique Eckert, led scientist. In fact, if the researchers manage to measure the atoms in these filaments, they will be able to estimate the number of heavy nuclei formed by stars since the beginning of the universe. In order to deepen this research, the European Space Agency (ESA) is in the process of developing a new space telescope. Switzerland and the researchers from UNIGE are especially involved in this project. The telescope, named Athena, should be operational in the mid-2020s. Baryons are composite particles made of three quarks, as opposed to mesons, which are composite particles made of one quark and one antiquark. Baryons and mesons are both hadrons, which are particles composed solely of quarks or both quarks and antiquarks. The term baryon is derived from the Greek "βαρύς" (barys), meaning "heavy", because, at the time of their naming, it was believed that baryons were characterized by having greater masses than other particles that were classed as matter. 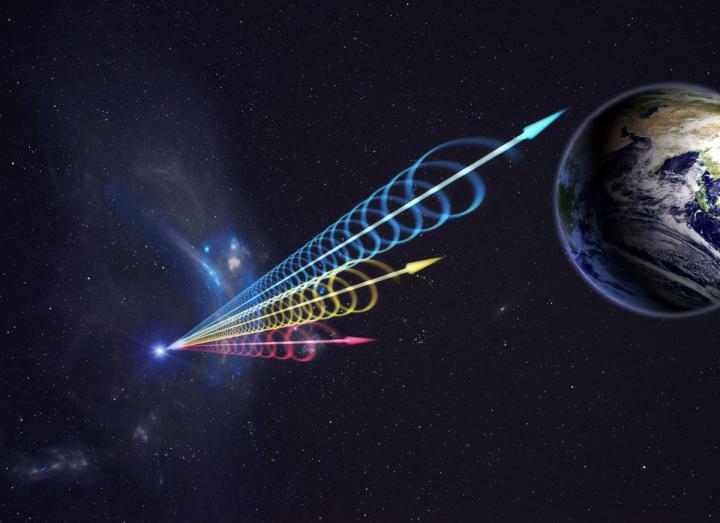 This is an artist impression of a Fast Radio Burst (FRB) reaching Earth. The colors represent the burst arriving at different radio wavelengths, with long wavelengths (red) arriving several seconds after short wavelengths (blue). This delay is called dispersion and occurs when radio waves travel through cosmic plasma. Image courtesy Jingchuan Yu, Beijing Planetarium. By poring over 650 hours of archival data from the National Science Foundation's (NSF) Green Bank Telescope (GBT), a team of astronomers uncovered the most detailed record ever of an FRB. Their research indicates that the burst originated inside a highly magnetized region of space, possibly linking it to a recent supernova or the interior of an active star-forming nebula. "We now know that the energy from this FRB passed through a dense, magnetized region shortly after it formed. This significantly narrows down the source's environment and type of event that triggered the burst," said Kiyoshi Masui, an astronomer with the University of British Columbia and the Canadian Institute for Advanced Research. The recorded data - a total of 40 terabytes - created a substantial analysis challenge, which was made even more difficult because the otherwise short, sharp signal of an FRB becomes "smeared out" in frequency by its journey through space. The team - primarily researchers with cosmology backgrounds - used this software to conduct an initial pass of the GBT data to flag any candidate signal. This yielded more than 6,000 possible FRBs, which were individually inspected by team member Hsiu-Hsien Lin from Carnegie Mellon University in Pittsburgh. His analysis winnowed the field until only one candidate remained. "Hidden within an incredibly massive dataset, we found a very peculiar signal, one that matched all the known characteristics of a Fast Radio Burst, but with a tantalizing extra polarization element that we simply have never seen before," said Jeffrey Peterson, a faculty member in Carnegie Mellon's McWilliams Center for Cosmology. Polarization is a property of electromagnetic radiation, including light and radio waves, and indicates the orientation of the wave. Polarizing sunglasses use this property to block out a portion of the Sun's rays and 3-D movies use it to achieve the illusion of depth. "This tells us something about the magnetic field that the burst traveled through on its way to us, giving a hint about the burst's environment," explained Masui. "It also gives the theorists a bit more to work with when they come up with explanations for these bursts." Further analysis of the signal reveals that it also passed through two distinct regions of ionized gas, called screens, on its way to Earth. By using the interplay between the two screens, the astronomers were able to determine their relative locations. The strongest screen is very near the burst's source - within a hundred thousand light-years - placing it inside the source's galaxy. Only two things could leave such an imprint on the signal, the researchers note: a nebula surrounding the source or the environment near the center of a galaxy. "Taken together, these remarkable data reveal more about an FRB than we have ever seen before and give us important constraints on these mysterious events," concludes Masui. "We also have an exciting new tool to search through otherwise overwhelming archival data to uncover more examples and get closer to truly understanding their nature." This is a photo of nearby white dwarf Sirius B. No, not the big star at center -- the little faint one just to the bottom-left. New observations of a white dwarf reveal that it is a scorcher, at roughly 250,000 degrees Celsius (482,000 Fahrenheit) -- about 2.5 times hotter than a typical star remnant that is just beginning to cool. What's more, scientists discovered the dwarf lives just at the edge of the Milky Way, contradicting previous research showing it is from outside the galaxy. The new observations come courtesy of ultraviolet observations performed by the Hubble Space Telescope, suggesting that the star was once five times more massive than our own Sun. No one is quite sure how this star got so hot, and its chemical composition still needs to be analyzed. "The strange thing about this white dwarf (and its cooler twin H1504+65) is the surface composition," wrote lead author Klaus Werner of the University of Tübingen in Germany, in an e-mail to Discovery News. "It is carbon and oxygen without hydrogen and helium. Currently, there is no good explanation for this phenomenon. Commonly, white dwarfs have either hydrogen-dominated or helium-dominated atmospheres." A little bit is known about RX J0439.8-6809 by modelling its history. It appears the star's temperature peaked at more than 400,000 degrees Celsius about 1,000 years ago. It was spotted in X-ray images about 20 years ago because it was so hot, but it originally was believed to be in the Large Magellanic Cloud, a galaxy outside of our own. 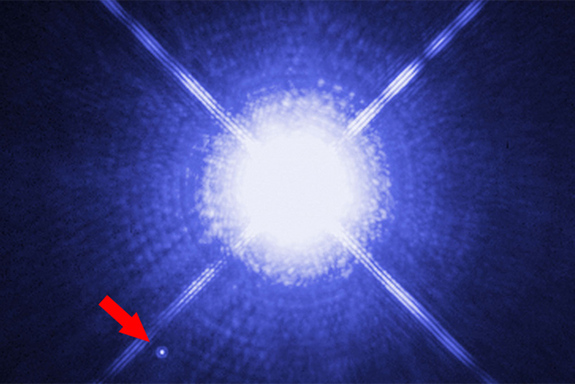 "Future X-ray surveys (eRosita) combined with optical surveys might reveal more of this kind of white dwarf with unusual surface composition," Werner added. "The search for trace elements (other metals) might give hints as to the evolutionary history." The research was recently published in the journal Astronomy and Astrophysics. Astronomers harnessing the combined power of NASA's Hubble and Spitzer space telescopes have found the faintest object ever seen in the early universe. It existed about 400 million years after the big bang, 13.8 billion years ago. The team has nicknamed the object Tayna, which means "first-born" in Aymara, a language spoken in the Andes and Altiplano regions of South America. 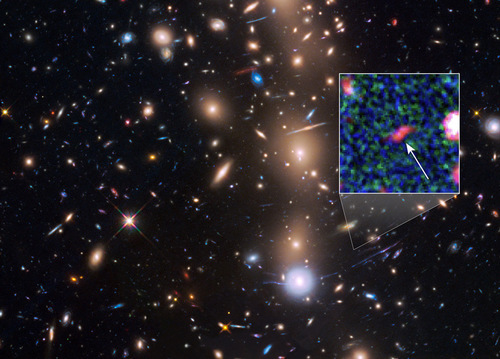 Though Hubble and Spitzer have detected other galaxies that are record-breakers for distance, this object represents a smaller, fainter class of newly forming galaxies that until now have largely evaded detection. These very dim objects may be more representative of the early universe, and offer new insight on the formation and evolution of the first galaxies. "Thanks to this detection, the team has been able to study for the first time the properties of extremely faint objects formed not long after the big bang," said lead author Leopoldo Infante, an astronomer at Pontifical Catholic University of Chile (Pontificia Universidad Catlica de Chile). The remote object is part of a discovery of 22 young galaxies at ancient times located nearly at the observable horizon of the universe. 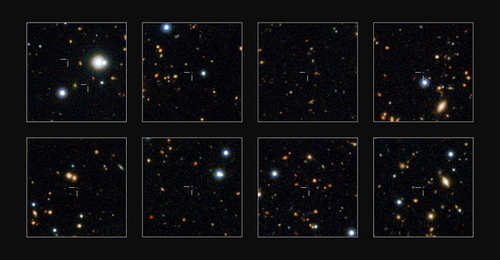 This research is a substantial increase in the number of known very distant galaxies. The results are published in the Dec. 3 issue of The Astrophysical Journal. The new object is comparable in size to the Large Magellanic Cloud (LMC), a diminutive satellite galaxy of our Milky Way. It is rapidly making stars at a rate ten times faster than the LMC. The object might be the growing core of what will likely evolve into a full-sized galaxy. The small and faint galaxy was only seen thanks to a natural "magnifying glass" in space. As part of its Frontier Fields program, Hubble observed a massive cluster of galaxies, MACS J0416.1-2403, located roughly 4 billion light-years away and weighing as much as a million billion suns. This giant cluster acts as a powerful natural lens by bending and magnifying the light of far-more-distant objects behind it. Like a zoom lens on a camera, the cluster's gravity boosts the light of the distant protogalaxy to make it look 20 times brighter than normal. The phenomenon is called gravitational lensing and was proposed by Albert Einstein as part of his General Theory of Relativity. Its distance was estimated by building a color profile from combined Hubble and Spitzer observations. The expansion of the universe causes the light from distant galaxies to be stretched or reddened with increasing distance. Though many of the galaxy's new stars are intrinsically blue-white, their light has been shifted into infrared wavelengths that are measurable by Hubble and Spitzer. Absorption by intervening, cool, intergalactic hydrogen also makes the galaxies look redder. This finding suggests that the very early universe will be rich in galaxy targets for the upcoming James Webb Space Telescope to uncover. Astronomers expect that Webb will allow us to see the embryonic stages of galaxy birth shortly after the big bang. Astronomers discovered a nest of monstrous baby galaxies 11.5 billion light-years away using the Atacama Large Millimeter/submillimeter Array (ALMA). The young galaxies seem to reside at the junction of gigantic filaments in a web of dark matter. These findings are important for understanding how monstrous galaxies like these are formed and how they evolve in to huge elliptical galaxies. We are living in a relatively quiet period in the history of the Universe. Ten billion years ago, long before the Sun and Earth were formed, areas of the Universe were inhabited by monstrous galaxies with star formation rates hundreds or thousands of times what we observe today in the Milky Way galaxy. There aren't any monstrous galaxies left in the modern Universe, but astronomers believe that these young galaxies matured into giant elliptical galaxies which are seen in the modern Universe. Current galaxy formation theories predict that these monstrous galaxies form in special environments where dark matter is concentrated. But up until now it has been difficult to determine the positions of active star forming galaxies with enough precision to actually test this prediction. Part of the problem is that monstrous star-forming galaxies are often obscured in dust, making them difficult to observe in visible light. Dusty galaxies do emit strong radio waves with submillimeter wavelengths, but radio telescopes typically have not had the resolution needed to pin-point individual galaxies. To search for monstrous galaxies, the research team led by Hideki Umehata (a postdoctoral fellow of the Japan Society for the Promotion of Science staying at the European Southern Observatory, Germany), Yoichi Tamura (an assistant professor at the University of Tokyo), and Kotaro Kohno (a professor at the University of Tokyo) used ALMA to make extensive observations of a small part of the sky called SSA22 in the constellation Aquarius (the Water-Bearer). Before their ALMA observations, the team searched for baby galaxies in SSA22 with ASTE, a 10-m submillimeter telescope operated by NAOJ. While the sensitivity and resolution was not sufficient to be sure, in the ASTE images they could see indications that there might be a cluster of monstrous galaxies. With ten times better sensitivity and 60 times better resolution, ALMA enabled astronomers to pinpoint the locations of nine monstrous galaxies in SSA22. The team compared the positions of these galaxies with the location of a cluster of young galaxies 11.5 billion light-years from Earth in SSA22 which had been studied in visible light by the Subaru Telescope, operated by the National Astronomical Observatory of Japan (NAOJ). The shape of the cluster observed by the Subaru Telescope indicates the presence of a huge 3D web of invisible dark matter. This dark matter filamentary structure is thought to be a progenitor of large scale structures in the Universe. One of the best known examples of large scale structure in the modern Universe is the cosmic Great Wall, a gigantic filamentary structure spanning over 500 million light-years. The filamentary structure in SSA22 could be called a proto-Great Wall. The team found that their young monstrous galaxies seemed to bewere located right at the intersection of the dark matter filaments. This finding supports the model that monstrous galaxies form in areas where dark matter is concentrated. And since modern large elliptical galaxies are simply monstrous galaxies which have mellowed with age, they too must have originated at nexuses in the large scale structure. This result is a very important step for a comprehensive understanding of the relation between the dark matter distribution and monstrous galaxies. The team will continue its extensive search for monstrous galaxies to look back even farther into the early history of the Universe to study the evolution of the large scale structure. This observation result was published as Umehata et al. "ALMA Deep Field in SSA22: A concentration of dusty starbursts in a z=3.09 protocluster core" in the Astrophysical Journal Letters, issued on Dec. 4, 2015. This press release was issued by The University of Tokyo on Dec. 5th, 2015 in Japanese. English version is translated by the National Astronomical Observatory of Japan. Birth of a blue straggler star. Left: A normal star in a binary system gravitationally pulls in matter from an aging companion star that has swelled to a bloated red giant that is a few hundred times its original size. Right: After a couple hundred million years, the red giant star has burned out and collapsed to the white dwarf that shines intensely in ultraviolet wavelengths. The companion star has bulked up on hydrogen siphoned from the red giant to become much hotter, brighter and bluer. Image courtesy NASA/ESA, A. Feild (STScI). Starting around 1950, a series of advances formed a clear and accepted picture of how individual stars are born, evolve and die. As they age, the changing patterns of color, light output, size and lifespan of stars are predictable. Every star like the sun will become a red giant, a planetary nebula and finally a white dwarf. But half of all stars are in binaries - pairs of stars that orbit each other. Half of binary stars orbit so close that gravitational interaction significantly affects their evolution and demise. Today, scientists led by Robert Mathieu, a professor of astronomy at the University of Wisconsin-Madison, and his former student Natalie Gosnell confirmed one of the possible explanations for a common group of exceptions: the blue stragglers. Blue stragglers look younger and brighter than their age would suggest - skirting, in other words, the clean, clear rules of stellar evolution. Since their discovery in 1953, blue stragglers have been begging for explanation. Had two stars collided to form a more massive star? 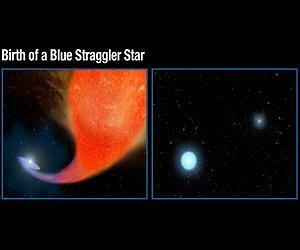 Was a blue straggler "stealing" gas from a companion star? In recent years, based on observations at the WIYN telescope at Kitt Peak, Arizona, Mathieu and his students have established that over three-quarters of blue stragglers, in fact, have stellar companions. This week, in a paper in The Astrophysical Journal, Gosnell, Mathieu and colleagues identified the orbital partner that was parasitized by the blue straggler. The victim, they found, was a red giant that donated hydrogen gas for eons until it was eventually transformed into a white dwarf - the old, small, bright and dense remnant of a red giant. The researchers used the Hubble Space Telescope to study the "colors" of far ultraviolet light coming from blue stragglers and their companions. At a distance of 5,500 light years, the blue straggler binary appears as a single point of light, but by analyzing the amount of ultraviolet light, the researchers saw the unmistakable signal of a white dwarf. The study builds on a series of logical deductions. The stars being studied were identified as members of a binary pair because they periodically move closer to and further from Earth - the hallmark of an orbiting pair of stars. Their optical color and intensity marked them as blue stragglers. They are bright in the far ultraviolet, a trademark of a hot white dwarf. And finally, for the white dwarfs to still be hot and detectable, they can only be 300 million years old. "These blue stragglers were formed 'yesterday,'" says Mathieu. White dwarfs form when certain stars lose their outer atmospheres. The mass "must be going somewhere," Gosnell says, "and that's to the companion normal star, which is close enough to attract the mass through gravity. Therefore, the white dwarf is left over after adding mass to a star, which becomes the blue straggler." The study expands our understanding of a major area of stellar evolution. If half of all stars are in binaries, and half of the binaries are, like the blue straggler, close enough to have gravitational interaction, then "these stars are not just an afterthought, a contaminant to our neat picture," Gosnell says. "We need to bring this 25 percent of all stars into the fold, so we can say we really understand how stars evolve." If scientists don't know how the blue stragglers formed, they are in a poor position to understand how they will evolve and die, adds Gosnell, who is now a postdoctoral fellow at the University of Texas. "Of course, we still have a third of the blue stragglers to figure out. 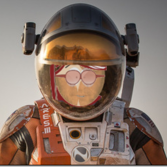 I think we also have some stellar collisions in there." "Our understanding of single-star evolution is one of the great intellectual achievements of the last century," says Mathieu. "We began with points of light in the sky, and with the application of new instrumentation, the physics breakthroughs of the last century, and computers, we took those points of light and turned them into a narrative of star life. "For the evolution of single stars like our sun, by and large, we got it right, from birth to death. Now we're starting to do the same thing for the one-quarter of stars that are close-orbiting binaries. This work allows us to talk not about points of light, but about the evolution of galaxies, including our own Milky Way. That's a big deal, and getting it right is an even bigger deal." Short-lived 244Pu points to compact binary mergers as sites for heavy r-process nucleosynthesis. Kenta Hotokezaka, Tsvi Piran and Michael Paul. Nature Physics 1042 (2015) doi:10.1038/nphys3574, Published 01 December 2015. 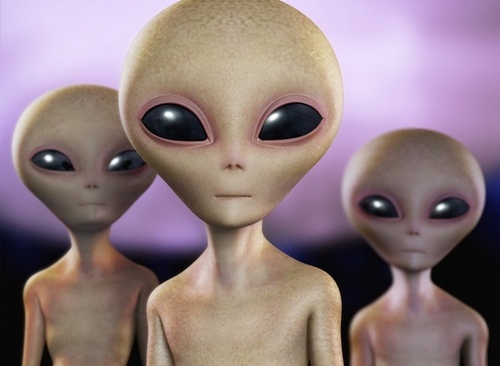 In a letter published in the prestigious journal Nature Physics, a team of scientists from The Hebrew University of Jerusalem suggests a solution to the Galactic radioactive plutonium puzzle. All the Plutonium used on Earth is artificially produced in nuclear reactors. Still, it turns out that it is also produced in nature. The Milky Way arcs into a panorama in the southern sky, taken from the Paranal Observatory, Chile. Image courtesy ESO/H.H. Heyer. When our galaxy was born, around 13,000 million years ago, a plethora of clusters containing millions of stars emerged. But over time, they have been disappearing. However, hidden behind younger stars that were formed later, some old and dying star clusters remain, such as the so-called E 3. European astronomers have now studied this testimony to the beginnings of our galaxy. Globular clusters are spherical-shaped or globular stellar groupings - hence its name- which can contain millions of stars. There are about 200 of them in the Milky Way, but few are as intriguing to astronomers as the E 3 cluster. It is situated around 30,000 light years away, in the southern constellation of Chameleon. A team of Spanish and Italian astronomers have named it "a ghost from the Milky Way's past" in an article published recently in the Astronomy and Astrophysics journal. "This globular cluster, and a few similar ones - such as Palomar 5 or Palomar 14 - are `ghosts' because they appear to be in the last stages of their existence, and we say 'from the past' because they are very old. They were formed when our galaxy was virtually new-born, 13,000 million years ago," says one of the authors, Carlos de la Fuente Marcos. E 3 is hidden behind younger and brighter objects located between the cluster and Earth, but it has been possible to analyse it thanks to the Very Large Telescope (VLT) held in the European Southern Observatory (ESO) in Cerro Paranal, Chile. The data obtained revealed some surprises. "Unlike typical globular clusters, which contain hundreds of thousands and in some cases millions of stars, the object studied only has a few tens of thousands of them," says De la Fuente Marcos. "Additionally, it doesn't have the typical circular symmetry, but a much distorted, almost ghostly, rhomboidal shape, contorted by the galactic gravitational waves". According to another study on E 3 by Michigan State University (USA) researchers, published in The Astrophysical Journal, this cluster is chemically homogeneous, that is, it doesn't have several star populations in its interior. "This is characteristic of an object that was created in block, in one single episode, like what is supposed to have happened when our galaxy was born: very large star clusters (containing millions of stars) were formed, but what remains of them today are objects like E 3, ghosts from a distant past," says De la Fuente Marcos. He explains that the study of these objects "enables us to gain insight into the infancy of the Milky Way". Despite the recently published new data on this strange globular cluster, astronomers still have to clarify if it was really formed in our galaxy or not. It is known that some of its clusters are not native to the Milky Way, but were captured, even though they can currently be seen in its interior. Thousands of millions of years ago, our galaxy cannibalised other smaller galaxies and kept their globular clusters. The rest were formed in-situ. In the article, it is suggested that the object analysed could be dynamically related to other clusters, such as 47 Tucanae, one of the richest and largest of the Milky Way. They could even share the same stream of stars. If this were the case, it would support the hypothesis that E 3 was captured in the distant past. 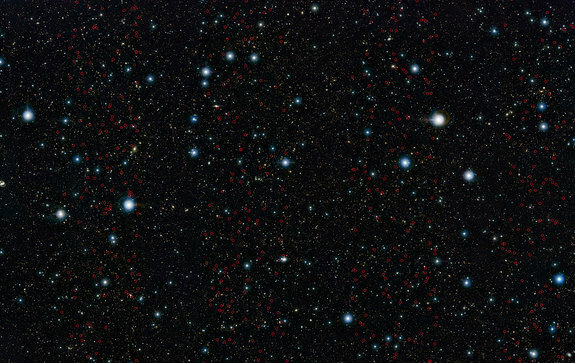 "We hope to obtain new data in 2016, thanks to more spectroscopic observations, and perhaps we will be able to give answers to these questions," says De la Fuente Marcos, an independent astronomer who collaborates with colleagues from the Northern Catholic University and ESO in Chile, and the University of Padua, Italy. Black-hole-powered galaxies called blazars are the most common sources detected by NASA's Fermi Gamma-ray Space Telescope. As matter falls toward the supermassive black hole at the galaxy's center, some of it is accelerated outward at nearly the speed of light along jets pointed in opposite directions. When one of the jets happens to be aimed in the direction of Earth, as illustrated here, the galaxy appears especially bright and is classified as a blazar. A long time ago in a galaxy half the universe away, a flood of high-energy gamma rays began its journey to Earth. When they arrived in April, NASA's Fermi Gamma-ray Space Telescope caught the outburst, which helped two ground-based gamma-ray observatories detect some of the highest-energy light ever seen from a galaxy so distant. The observations provide a surprising look into the environment near a supermassive black hole at the galaxy's center and offer a glimpse into the state of the cosmos 7 billion years ago. "When we looked at all the data from this event, from gamma rays to radio, we realized the measurements told us something we didn't expect about how the black hole produced this energy," said Jonathan Biteau at the Nuclear Physics Institute of Orsay, France. He led the study of results from the Very Energetic Radiation Imaging Telescope Array System (VERITAS), a gamma-ray telescope in Arizona. Astronomers had assumed that light at different energies came from regions at different distances from the black hole. Gamma rays, the highest-energy form of light, were thought to be produced closest to the black hole. "Instead, the multiwavelength picture suggests that light at all wavelengths came from a single region located far away from the power source," Biteau explained. The observations place the area roughly five light-years from the black hole, which is greater than the distance between our Sun and the nearest star. The gamma rays came from a galaxy known as PKS 1441+25, a type of active galaxy called a blazar. Located toward the constellation Botes, the galaxy is so far away its light takes 7.6 billion years to reach us. At its heart lies a monster black hole with a mass estimated at 70 million times the Sun's and a surrounding disk of hot gas and dust. If placed at the center of our solar system, the black hole's event horizon -- the point beyond which nothing can escape -- would extend almost to the orbit of Mars. 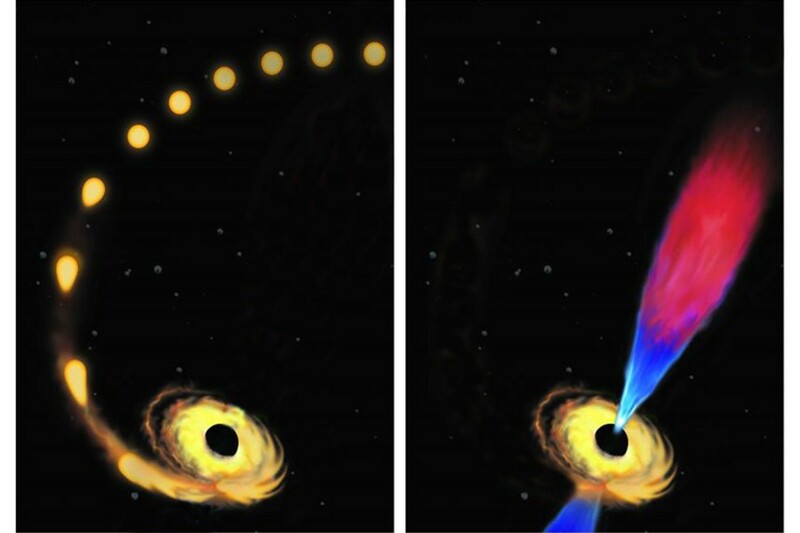 As material in the disk falls toward the black hole, some of it forms dual particle jets that blast out of the disk in opposite directions at nearly the speed of light. Blazars are so bright in gamma rays because one jet points almost directly toward us, giving astronomers a view straight into the black hole's dynamic and poorly understood realm. In April, PKS 1441+25 underwent a major eruption. Luigi Pacciani at the Italian National Institute for Astrophysics in Rome was leading a project to catch blazar flares in their earliest stages in collaboration with the Major Atmospheric Gamma-ray Imaging Cerenkov experiment (MAGIC), located on La Palma in the Canary Islands. Using public Fermi data, Pacciani discovered the outburst and immediately alerted the astronomical community. Fermi's Large Area Telescope revealed gamma rays up to 33 billion electron volts (GeV), reaching into the highest-energy part of the instrument's detection range. For comparison, visible light has energies between about 2 and 3 electron volts. "Detecting these very energetic gamma rays with Fermi, as well as seeing flaring at optical and X-ray energies with NASA's Swift satellite, made it clear that PKS 1441+25 had become a good target for MAGIC," Pacciani said. Following up on the Fermi alert, the MAGIC team turned to the blazar and detected gamma rays with energies ranging from 40 to 250 GeV. "Because this galaxy is so far away, we didn't have a strong expectation of detecting gamma rays with energies this high," said Josefa Becerra Gonzalez, a researcher at NASA's Goddard Space Flight Center in Greenbelt, Maryland, who analyzed Fermi LAT data as part of the MAGIC study. "There are fewer and fewer gamma rays at progressively higher energies, and fewer still from very distant sources." The reason distance matters for gamma rays is that they convert into particles when they collide with lower-energy light. The visible and ultraviolet light from stars shining throughout the history of the universe forms a remnant glow called the extragalactic background light (EBL). For gamma rays, this is a cosmic gauntlet they must pass through to be detected at Earth. When a gamma ray encounters starlight, it transforms into an electron and a positron and is lost to astronomers. The farther away the blazar is, the less likely its highest-energy gamma rays will survive to be detected. Following the MAGIC discovery, VERITAS also detected gamma rays with energies approaching 200 GeV. Findings from both teams are detailed in papers published Dec. 15 in The Astrophysical Journal Letters. PKS 1441+25 is one of only two such distant sources for which gamma rays with energies above 100 GeV have been observed. Its dramatic flare provides a powerful glimpse into the intensity of the EBL from near-infrared to near-ultraviolet wavelengths and suggests that galaxy surveys have identified most of the sources responsible for it. More distant blazars show a loss of higher-energy gamma rays thanks to the extragalactic background light (EBL), a "cosmic fog" of visible and ultraviolet starlight that permeates the universe. 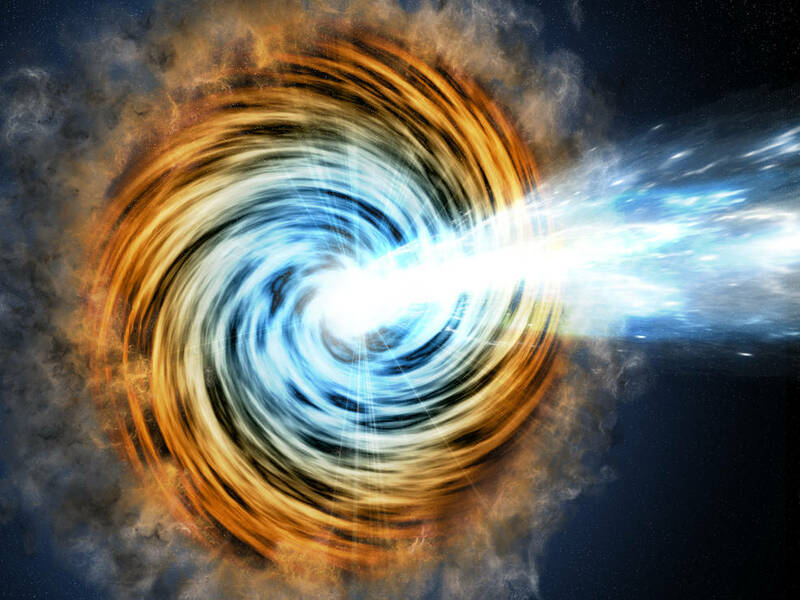 From studies of nearby blazars, scientists know how many gamma rays should be emitted at different energies. If a gamma ray on its way to Earth collides with lower-energy light in the EBL, it converts into a pair of particles and is lost to astronomers. 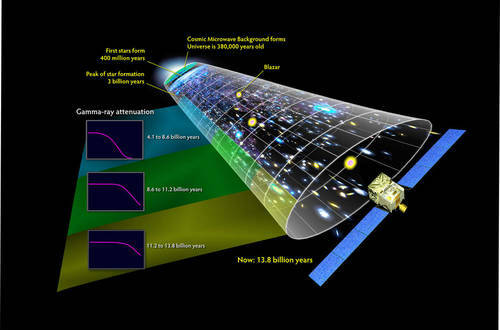 As shown by the graphs at left in this illustration, the more distant the blazar, the fewer high-energy gamma rays we can detect. During the April 2015 outburst of PKS 1441+25, MAGIC and VERITAS saw rare gamma rays exceeding 100 GeV that managed to survive a journey of 7.6 billion light-years. The star 55 Cancri and one of it's planets, 55 Cancri e, are two celestial objects that have been given new names through a contest that allowed members of the public to suggest and vote on names for distant stars and alien planets. The people have spoken: 14 distant stars and 31 alien planets are getting new names that have been selected and voted on by members of the public. And those exoplanet names include some wild ones like Poltergeist, Thestias and even Quijote. Today (Dec. 15), the International Astronomical Union (IAU) announced the winners of its NameExoWorlds contest. Members of the public were free to vote on 274 proposed names submitted by various groups, including amateur astronomy clubs, schools, universities and planetariums from 45 countries, according to the IAU. In total, the contest drew in 573,242 votes from 182 countries. The winning titles included the names of characters from ancient mythology, famous scientists, fictional characters, ancient cities and more. One star and three of its planets were all named after "undead" creatures from fiction and mythology: Lich, Draugr, Poltergeist and Phobetor. The star is a neutron star, which is actually the collapsed core of a star that has run out of fuel and "died," making it a kind of celestial zombie. Australian researchers have discovered why some galaxies are "clumpy" rather than spiral in shape--and it appears low spin is to blame. The finding challenges an earlier theory that high levels of gas cause clumpy galaxies and sheds light on the conditions that brought about the birth of most of the stars in the Universe. 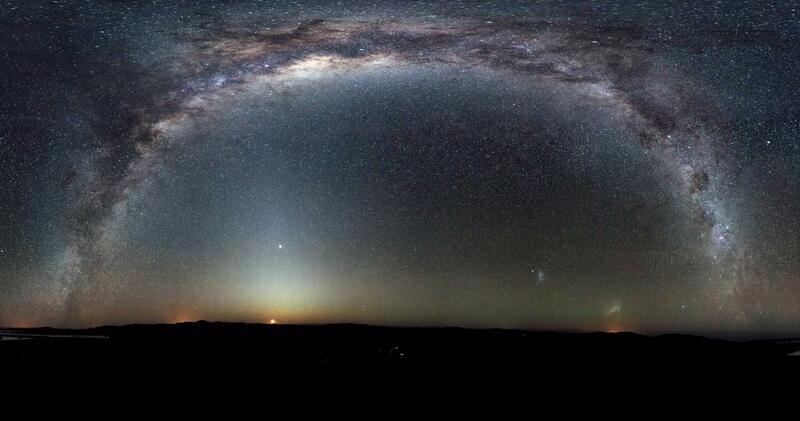 Lead author Dr Danail Obreschkow, from The University of Western Australia node of the International Centre for Radio Astronomy Research (ICRAR), said that ten billion years ago the Universe was full of clumpy galaxies but these developed into more regular objects as they evolved. He said the majority of stars in the sky today, including our five billion-year-old Sun, were probably born inside these clumpy formations. "The clumpy galaxies produce stars at phenomenal rates," Dr Obreschkow said. "A new star pops up about once a week, whereas spiral galaxies like our Milky Way only form about one new star a year." The research team--a collaboration between ICRAR and Swinburne University of Technology--focused on a few rare galaxies, known as the DYNAMO galaxies. They still look clumpy even though they're seen "only" 500 million years in the past. Dr Obreschkow said looking at galaxies 500 million years ago was like looking at a passport photo taken a year ago. "We see that galaxy the way it probably looks now... something could have happened to it but it's very unlikely," he said. "The galaxies that are 10 billion light years away, that's comparable to a picture from when you were three or four years old, that's very different." The team used the Keck and Gemini observatories in Hawaii to measure the spin of the galaxies, along with millimetre and radio telescopes to measure the amount of gas they contained. Dr Obreschkow said the DYNAMO galaxies had a low spin and this was the dominant cause of their clumpiness, rather than their high gas content as previously thought. "While the Milky Way appears to have a lot of spin, the galaxies we studied here have a low spin, about three times lower," he said. Swinburne University astronomer Professor Karl Glazebrook, co-author and leader of the survey team, said the finding was exciting because the first observation that galaxies rotate was made exactly 100 years ago. "Today we are still revealing the important role that the spin of the initial cloud of gas plays in galaxy formation," he said. "This novel result suggests that spin is fundamental to explaining why early galaxies are gas-rich and lumpy while modern galaxies display beautiful symmetric patterns." IMAGE: CALIBRATOR SOURCES HAVE FLAT RADIO SPECTRA. MOLECULES IN THE INTERVENING GAS CLOUDS ABSORB RADIO WAVES AT SPECIFIC FREQUENCIES DETERMINED BY THE TYPE OF MOLECULES. Astronomers using the Atacama Large Millimeter/submillimeter Array (ALMA) have discovered the most tenuous molecular gas ever observed. 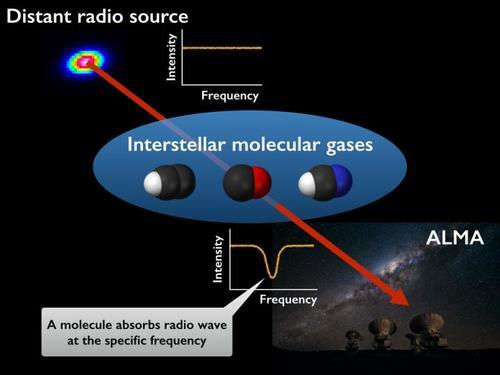 They detected the absorption of radio waves by gas clouds in front of bright radio sources. This radio shadow revealed the composition and conditions of diffuse gas in the Milky Way galaxy. To calibrate its systems, ALMA looks at objects emitting strong radio waves (radio 'bright' objects). On rare occasions, the signals from distant calibrator sources have specific radio frequencies absorbed out of them by foreground gas. This process is similar to how a piece of tinted glass casts a colored shadow when light passes through it. These absorption features contain valuable information about the intervening gas clouds which absorbed the radio signals. However, the number of known molecular absorption systems seen in millimeter/submillimeter waveband has been very limited: only about 30 in the Milky Way galaxy and a limited number in other galaxies. To find more absorption systems, a research team including Ryo Ando (a graduate student at the University of Tokyo), Kotaro Kohno (a professor at the University of Tokyo), and Hiroshi Nagai (a project associate professor at the National Astronomical Observatory of Japan) collected the calibration data from the ALMA Data Archive. By examining data from 36 calibrator sources, the team discovered three new absorption systems and confirmed one previously known system. For one calibrator source, J1717-337, they found absorptions caused by ten different molecules, such as C3H2, CS, and HCS+. In addition, the team found absorption signals caused by HCO molecules for two of the calibrator sources, J1717-337 and NRAO530. The HCO absorption signal is very rare; only three other examples are known in the Milky Way galaxy. Absorption systems allow researchers to investigate very tenuous gas clouds. A gas cloud too diffuse to emit sufficient radio waves to be detected can still absorb enough radio waves to produce a detectable radio shadow. The team estimated that the amount of HCO in the cloud backlit by NRAO530 is only half that of other known systems. This shows that it is one of the most diffuse gas clouds ever discovered in the Milky Way galaxy. Even though astronomers assume that tenuous gas clouds account for a considerable fraction of the total mass of the Milky Way galaxy, very little is known about them. The absorption signals help us determine the environment around the foreground gas clouds. HCO molecules are thought to be formed in special environments full of intense ultraviolet light from giant young stars. The diffuse gas clouds backlit by J1717-337 and NRAO530 show chemical composition similar to the gas in active star forming regions, indicating that the diffuse gas is bathed in strong ultraviolet light. Astronomers believe that ultraviolet light affects the properties of diffuse clouds. The HCO absorption systems found by ALMA provide an opportunity to verify that idea. This research revaluates the importance of the ALMA calibration data. Usually the calibration data are considered supplementary, but this research shows that the calibration data themselves may contain significant scientific discoveries. The data for the more than 1000 calibration sources stored in the ALMA Data Archive are publicly available, and ALMA continues to take calibration data as part of normal observations. For astronomers, the Archive is a gold mine with the potential to yield more absorption systems or other unexpected mysteries of the universe. 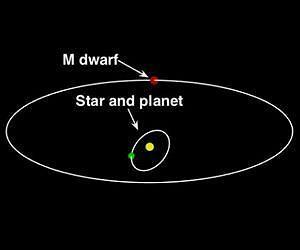 A team made up almost entirely of current and former Carnegie scientists has discovered a highly unusual planetary system comprised of a Sun-like star, a dwarf star, and an enormous planet sandwiched in between. The planet, first discovered in 2011 orbiting a star called HD 7449, is about eight times the mass of Jupiter and has one of the most eccentric orbits ever found. An eccentric orbit is one that deviates from being perfectly circular. The further from a circle it is, the more eccentric it is. A large eccentricity can also indicate that a planet is being affected by other objects nearby. For the planet around HD 7449, the large eccentricity was a clue that something else - something bigger than the known planet - also resided in the system. "The question was: is it a planet or a dwarf star?" said lead author Timothy Rodigas. To answer the question, Rodigas and his team used the Magellan adaptive optics (MagAO) instrument suite to directly image the mysterious object. MagAO, commissioned in 2013, enables astronomers to take extremely high-resolution images, giving them a sharper look at the night sky than ever before. "At the telescope, we saw the object within seconds, and that told us it had to be a dwarf star," Rodigas added. Just another boring star, right? No, this one is tiny, only 20 percent of the mass of the Sun, and its orbit places it close to the primary star, HD 7449A, just 18 astronomical units (AU) away. (1 AU is the distance from the Earth to the Sun.) For comparison, Neptune orbits the Sun at 30 AU. Not long ago, binaries (two co-orbiting stars) were thought incapable of hosting planets, but over the past few years the number of circumbinary planets detected has been steadily growing. This system, though, is one of only a handful consisting of a Sun-like star, a dwarf star, and a gas giant planet in between - all within 20 AU. What's more, among these, the planet HD 7449Ab is by far the most massive and has the most eccentric orbit. The authors believe that the dwarf star and the planet have been gravitationally influencing each other for millions of years. 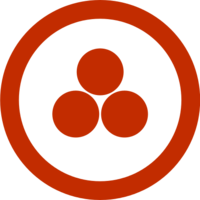 Specifically, the planet's eccentricity and orbital inclination, meaning its angle relative to the equatorial plane of the primary star, have been oscillating back and forth in a process known as Kozai oscillations - and will continue to do so for the foreseeable future. "It's difficult to visualize what happens to the planet over time, but you could say that it's 'dancing' between the two stars," Rodigas said. The team will continue to monitor the system over the coming years using both the radial velocity technique (which measures how stars wobble when planets orbit them), and direct imaging. They hope to determine how such a strange system could have formed. Using mathematical models, scientists have 'looked' into the interior of super-Earths and discovered that they may contain compounds that are forbidden by the classical rules of chemistry -- these substances may increase the heat transfer rate and strengthen the magnetic field on these planets. The findings have been presented in a paper published in the journal Scientific Reports. The authors of the paper are a group of researchers from MIPT led by Artem Oganov, a professor of the Skolkovo Institute of Science and Technology and the head of the MIPT Laboratory of Computer Design. In a previous study, Oganov and his colleagues used an algorithm created by Oganov called USPEX to identify new compounds of sodium and chlorine, as well as other exotic substances. In their latest paper, the researchers attempted to find out which compounds may be formed by silicon, oxygen, and magnesium at high pressures. These particular elements were not chosen by chance. "Earth-like planets consist of a thin silicate crust, a silicate-oxide mantle -- which makes up approximately 7/8 of the Earth's volume and consists more than 90% of silicates and magnesium oxide -- and an iron core. We can say that magnesium, oxygen, and silicon form the basis of chemistry on Earth and on Earth-like planets," says Oganov. Using the USPEX algorithm, the researchers investigated various structural compositions of Mg-Si-O that may occur at pressures ranging from 5 to 30 million atmospheres. Such pressures may exist in the interior of super-Earths -- planets with a solid surface mass several times greater than the mass of the Earth. There are no planets like this in the solar system, but astronomers know of planets orbiting other stars that are not as heavy as the gas giants, but are considerably heavier than the Earth. They are called super-Earths. These planets include the recently discovered Gliese 832c, which is five times heavier than the Earth, or the mega-Earth Kepler-10c, which is 17 times heavier than the Earth. The results of the computer modelling show that the interior of these planets may contain the "exotic" compounds MgSi3O12 and MgSiO6. They have many more oxygen atoms than the MgSiO3 on Earth. In addition, MgSi3O12 is a metal oxide and a conductor, whereas other substances consisting of Mg-Si-O atoms are dielectrics or semiconductors. "Their properties are very different to normal compounds of magnesium, oxygen, and silicon - many of them are metals or semiconductors. This is important for generating magnetic fields on these planets. 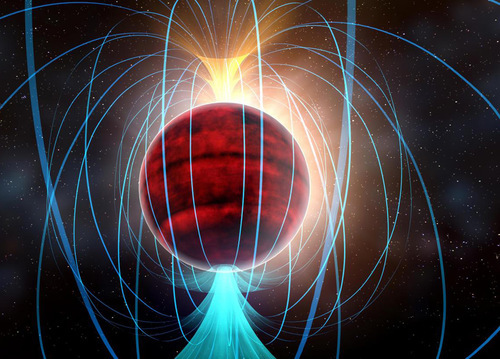 As magnetic fields produce electrical currents in the interiors of a planet, high conductivity could mean a significantly more powerful magnetic field," explains Oganov. In a nutshell, a stronger magnetic field affords better protection and a better chance for life form development. 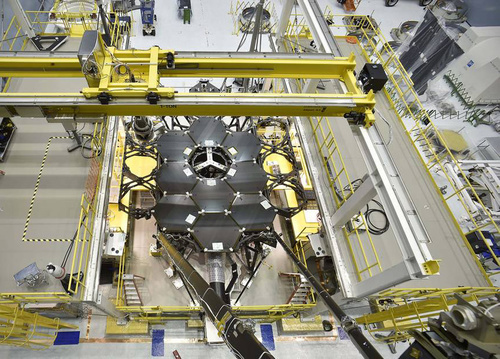 Inside NASA's Goddard Space Flight Center's massive clean room in Greenbelt, Maryland, the ninth flight mirror was installed onto the telescope structure with a robotic arm. his marks the halfway completion point for the James Webb Space Telescope's segmented primary mirror. Researchers have found a new way to measure the pull of gravity at the surface of a star. For distant stars with planets orbiting them, this information is key in determining whether any of those planets can harbour life. The new method is described in a study published today in Science Advances. The research was led by University of Vienna's Thomas Kallinger and involved UBC Professor Jaymie Matthews as well as astronomers from Germany, France and Australia. Knowing the surface gravity of a star is essentially knowing how much you would weigh on that star. If stars had solid surfaces on which you could stand, then your weight would change from star to star. The Sun is hotter than a sauna, but don't expect to lose weight there. You'd weigh 20 times more than on Earth. A red giant star (the far-future fate of our Sun) has a much weaker pull at its surface, so you'd be 50 times lighter. The new method allows scientists to measure surface gravity with an accuracy of about four per cent, for stars too distant and too faint to apply current techniques. Since surface gravity depends on the star's mass and radius (just as your weight on Earth depends on its mass and radius), this technique will enable astronomers to better gauge the masses and sizes of distant stars. It will play an exciting role in the study of planets beyond the Solar System, many so distant that even the basic properties of the stars they orbit can't be measured accurately. "If you don't know the star, you don't know the planet," said study co-author, UBC Professor Jaymie Matthews. "The size of an exoplanet is measured relative to the size of its parent star. If you find a planet around a star that you think is Sun-like but is actually a giant, you may have fooled yourself into thinking you've found a habitable Earth-sized world. Our technique can tell you how big and bright is the star, and if a planet around it is the right size and temperature to have water oceans, and maybe life." The new technique called the autocorrelation function timescale technique, or timescale technique for short, uses subtle variations in the brightness of distant stars recorded by satellites like Canada's MOST and NASA's Kepler missions. Future space satellites will hunt for planets in the 'Goldilocks Zones' of their stars. Not too hot, not too cold, but just right for liquid water oceans and maybe life. Future exoplanet surveys will need the best possible information about the stars they search, if they're to correctly characterize any planets they find. "The timescale technique is a simple but powerful tool that can be applied to the data from these searches to help understand the nature of stars like our Sun and to help find other planets like our Earth," said Kallinger, the study's lead author. There are many video's available to demonstrate the massive distances involved in the universe. These two articles demonstrate a "different" approach, the first being logarithmic, the second one being straight line evaluation. The universe is so vast it's almost impossible to picture what it might look like crammed into one field of view. But musician Pablo Carlos Budassi managed to do it by combining logarithmic maps of the universe from Princeton and images from NASA. 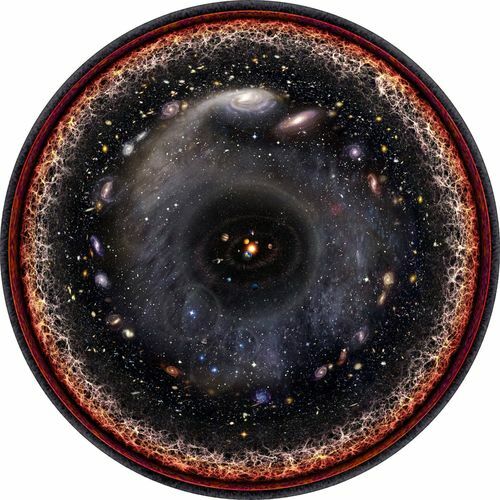 He created the image below that shows the observable universe in one disc. Logarithms help us make sense of huge numbers, and in this case, huge distances. Rather than showing all parts of the universe on a linear scale, each chunk of the circle represents a field of view several orders of magnitude larger than the one before it. That's why the entire observable universe can fit inside the circle. link is the presentation...move the slider on the bottom, left to right, to see various planets...etc. Astronomers have found a "burping" supermassive black hole is 26 million light-years from Earth in the Messier 51 galaxy (which includes the picturesque Whirlpool galaxy). 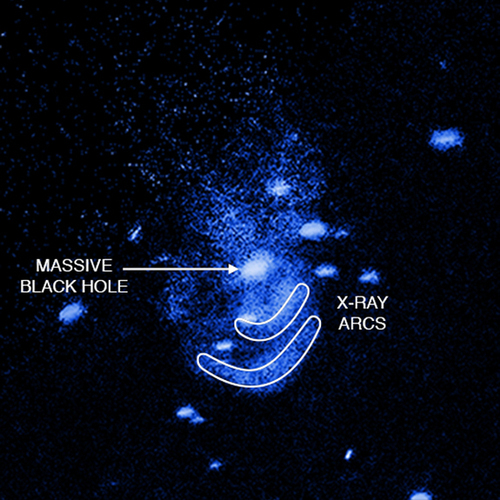 They used NASA's Chandra X-ray Observatory to spot the monster black hole, which is singled out in the X-ray view inset. KISSIMMEE, Fla. — A black hole's epic "burp" may help solve one of the deep mysteries of the galactic core. The dust-filled expanses of spiral galaxies like the Milky Way are bursting with star formation — the dustier the area is, the more likely it is for new stars to form there. But astronomers have found that stars rarely form in the center of a galaxy, where a supermassive black hole often rests, and researchers don't know why. Smaller, elliptical galaxies also show little star formation. A black hole relatively close to the Milky Way — a mere 26 million light-years from earth — has shown evidence of a huge X-ray blast outward that may have "snowplowed," or swept away, nearby star-forming dust. "This is the best example of snowplowed material I've ever seen," Eric Schlegel, lead author on the new study and researcher at the University of Texas at San Antonio, said in a press conference today (Jan. 5) at the American Astronomical Society's winter meeting today in Kissimmee, Florida. "This is clearly a way of ejecting gas from a galaxy." "For an analogy, astronomers often refer to black holes as 'eating' stars and gas," Schlegel added in a statement. "Apparently, black holes can also burp after their meal." Schlegel's team analyzed data from the orbiting Chandra X-ray Observatory to investigate the dwarf galaxy NGC 5195, which is in the process of merging with the flashier Whirlpool galaxy. 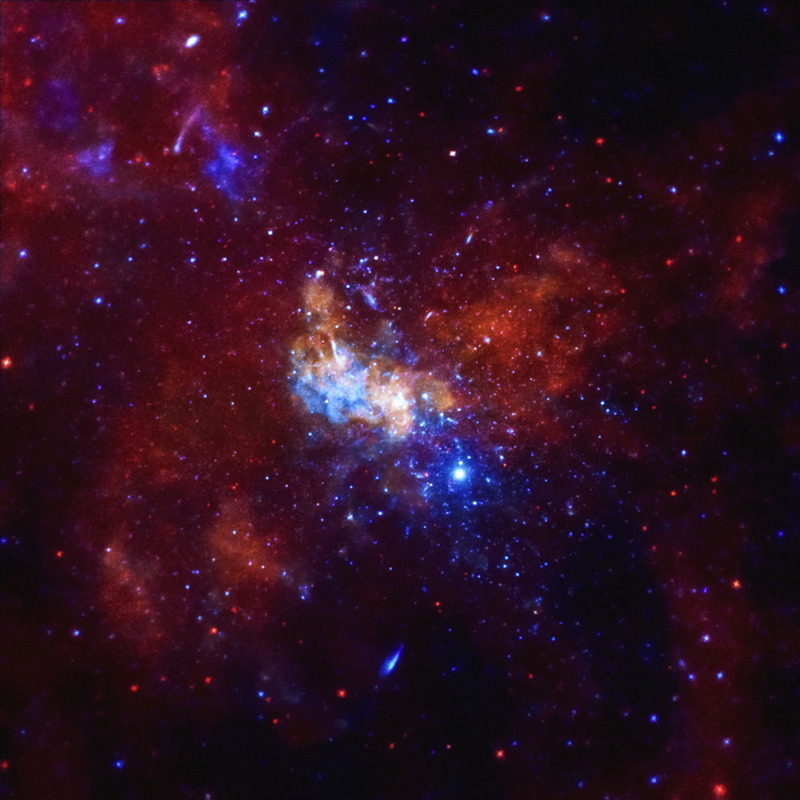 The researchers observed two arcs of X-rays near the center of the dwarf galaxy, which appear to be the remnants of two huge blasts outward from the black hole. Plus, the view from an optical telescope revealed a region of cooler hydrogen gas just past the X-ray arcs, which suggests the blasts pushed dust outward. Schlegel said that dust and gas from the galaxy's collision with the Whirlpool galaxy could have slingshotted around the black hole, but that he finds that unlikely. More probably, the black hole actually reacted to the large additional quantities of dust pushed into its path, resulting in the "burp," he said. The inner X-ray arc may have taken about 1 million to 3 million years to expand to its current position, and the outer one 3 million to 6 million years, officials said in the statement. There's much more to explore about this system, Schlegel noted. "How that reaction goes is very unclear, but I think it's clearly something that's worthy of study at other wavelengths," he said at the conference, "in addition to using simulations to try to [replicate] it." The researchers said they suspect this type of reaction might have been much more common in the early universe, when galaxies were more densely packed together, but this "nearby" galaxy exhibiting the behavior is an exciting opportunity to see it happening up close, with less distortion. The effect can reach further out than the dramatic winds that push material away from a black hole, and it is an interesting new example of how a supermassive black hole's activity can shape a galaxy, a process called feedback, the researchers said. 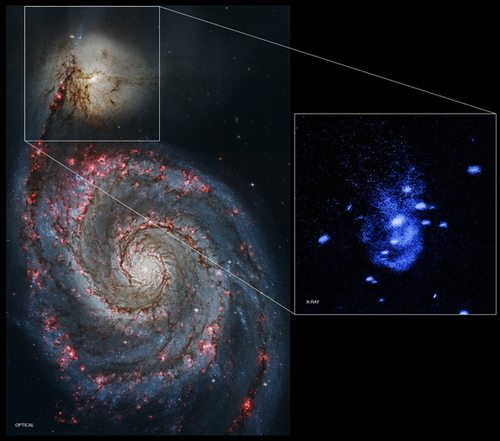 An annotated view of the "burping" supermassive black hole in the galaxy Messier 51 as seen in X-rays by NASA's Chandra X-ray Observatory in the galaxy Messier 51. The scientists also found something strange along the border of the blast: Although the "burp" may have swept dust-forming gas away from the center of the galaxy, enough was pushed up together outside the outer arc to form new stars, as well. "We think that feedback keeps galaxies from becoming too large," co-author Marie Machacek, a researcher at the Harvard-Smithsonian Center for Astrophysics, in Massachusetts, said in the statement. "But at the same time, it can be responsible for how some stars form. This shows that black holes can create, not just destroy." These results have been submitted to The Astrophysical Journal. An artist’s concept of aliens. Democratic presidential candidate Hillary Clinton appears to have an open mind when it comes to the possibility of alien life. You're just saying what everyone else is thinking regarding the "Wicked Witch of the North". No, you did great -- that was out of nowhere and I needed a laugh. Nice going, bud. As far as Politics getting fixed up -- unless we get a true altruistic and genuine influence in the whole world that wants to do better for everyone, everywhere and not just their own bank accounts I wouldn't bet on that horse, sadly. Even if one appeared it would be deemed some kind of threat by someone somewhere; their message distorted and they'd be destroyed before they could gain any kind of real influence. That's just the way Humanity in a general sense operates. 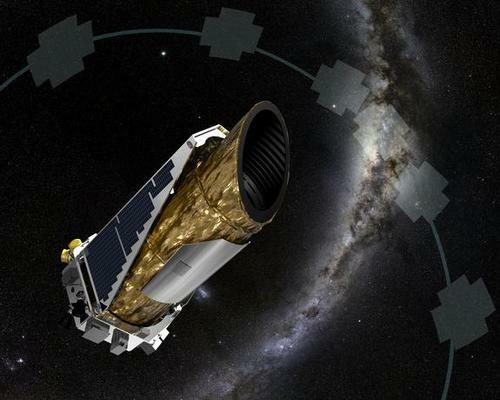 The artist's illustration shows NASA's planet-hunting Kepler spacecraft operating in its second-chance K2 mission. KISSIMMEE, Fla. — NASA's Kepler spacecraft has bounced back nicely from the malfunction that ended its original exoplanet hunt more than two years ago. Kepler has now discovered more than 100 confirmed alien planets during its second-chance K2 mission, researchers announced today (Jan. 5) here at the 227th Meeting of the American Astronomical Society (AAS). The $600 million Kepler mission launched in March 2009, tasked with determining how commonly Earth-like planets occur throughout the Milky Way galaxy. Kepler has been incredibly successful, finding more than 1,000 alien worlds to date, more than half of all exoplanets ever discovered. The spacecraft finds planets by the "transit method," noting the tiny brightness dips caused when a planet crosses its host star's face from Kepler's perspective. This technique requires extremely precise pointing, an ability Kepler lost in May 2013 when the second of the observatory's four orientation-maintaining reaction wheels failed. But the Kepler team quickly figured out a way to keep the telescope stable, using solar radiation pressure as a sort of third wheel. That meant the spacecraft could eye different patches of the sky for around 80 days at a time to search for planets and other cosmic bodies and phenomena. That's what Kepler has been doing in its K2 mission, which NASA greenlit in May 2014. Researchers had expressed hope that K2 could pick up some additional exoplanets and interesting structures in the sky. The extended mission has certainly delivered, spotting a few dozen confirmed planets, and now the tally will jump dramatically. The first five K2 campaigns, which each looked at a different part of the sky, "have produced over 100 validated planets," Ian Crossfield, an astronomer at University of Arizona, said today during a presentation at the AAS meeting. "This is a validation of the whole K2 program's ability to find large numbers of true, bona fide planets." Crossfield said that Kepler observed more than 60,000 stars and found 7,000 transitlike signals during the first five 80-day observation campaigns. A validation process whittled some of these signals down to planet candidates, and then finally to validated planets, each of which has just a 1 percent chance of being a false positive, Crossfield added. He also noted that K2 found more false positives among larger planets than small ones, and that more than half of the false positives were in multiplanet systems. While planning K2, Kepler principal investigator Bill Borucki, who retired this past July after a 53-year NASA career, said the new mission could find "dozens, or maybe even hundreds" of exoplanets. Now, K2 has racked up more than 100, and lots of exciting extrasolar systems will likely be spotted in the future, Crossfield said. "We're only a quarter or so of the way done, we hope," he said.